London (AFP) - Britain's Tyson Fury returns to the ring on Saturday hoping his boxing comeback can inspire other people who have been suffering from mental health problems. 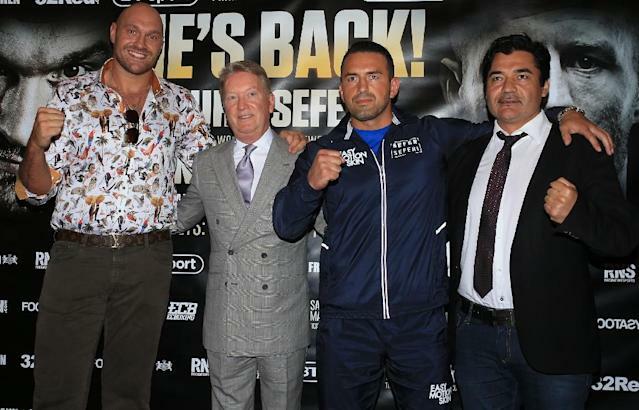 The unbeaten former world heavyweight champion takes on Albania's Sefer Seferi in Manchester on Saturday. Fury outweighs Seferi by more than four stone, a point he jokingly emphasised at Friday's weigh-in by picking up his opponent and cradling him in his arms. But Fury's time away away from boxing has been far from a laughing matter. He hasn't fought since a shock defeat of Wladimir Klitschko in November 2015 saw Fury win the world title. Since then, though, his career started to unravel and Fury was stripped of his boxing licence as he contested a ban over a failed drugs test. Meanwhile, the Briton gained weight at an alarming rate while battling depression and made a series of highly controversial, and to some offensive, statements about social issues. But the 29-year-old is confident he is now in good shape, both mentally and physically, as he looks to regain the world heavyweight crown. "I've had massive support throughout all my troubles, everybody's really been helping me and spurring me on," Fury said on Friday. "This isn't just me and my team, it's me and the whole nation. I seem to have everyone behind me and I'm coming back and fighting for them." He added: "I'm fighting for people who need inspiration and help -- people who suffer from mental health problems as well. "It's living proof if I can do it, then anyone can do it. To come from 27-and-a-half stone and to get to fighting level for Saturday night, then that is a statement, isn't it?" Fury has long felt he was unfairly stripped of the world title belts he won after beating Klitschko and has long spoken of his desire for a bout with reigning champion Anthony Joshua in an all-British encounter. But Fury was adamant he was focused on the task of beating Seferi, whose 23 professional career wins have all come at cruiserweight, with his lone loss to heavyweight contender Manuel Charr in September 2016. "I'm not here to dwell on the past, I'm here to move forward," Fury insisted. "That is all in the past so let's move on to the next chapter -- the new Tyson Fury, the people's champion. There's no negativity here."